This past weekend, my sweet Roomie Katie got married! 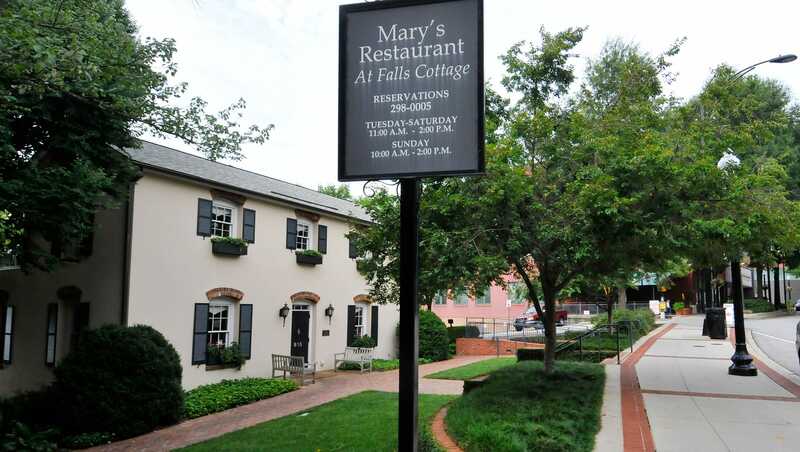 We kicked things off on Friday morning at our Bridal Luncheon at Mary’s at Falls Cottage, a historic building, now restaurant, in downtown Greenville, SC. Hometown of our sweet Katie. And the details were simply perfect! Just look at that lovely, personalized place setting. Our bride, her gorgeous mother Jean, and her grandmother Barbara. I love pictures like these… 3 generations of godly women! What a tremendous legacy Katie has stepped into. We laughed, we talked, we shared stories, we ate a delicious brunch, we prayed over Katie and her love Bill, took pictures, and ultimately, had a wonderful time. It was the perfect catapult into a blessed weekend of celebration. Here we all are at the rehearsal later that same evening. A bride and all her maids. Beautiful women, all of which I have so enjoyed getting to know during this season. They were married at Alder’s Gate United Methodist Church and I so regret not getting a picture of the beautiful stained glass windows that lined this charming sanctuary. For the rehearsal dinner, the groom’s parents hosted us for a lovely down-home, Southern comfort meal in the Fellowship Hall of the church where we enjoyed a slideshow of Bill and Katie’s younger years and then pictures of the two of them together in this last 13 months since they reconnected. We had an “open-mic night”, so to speak, and we shared lots of laughs and stories of shared memories with our bride and groom. It was a sweet time of celebration and so evident that this night and this weekend was the culmination of so many people’s prayers. And then, that brings us to the following day… the main event. The wedding. Everything was lovely, including this bride of ours. Isn’t she stunning? I know Bill had to firmly plant his feet at the foot of that altar just to be sure he didn’t fall over in shock when the wedding march began and she made her way up the aisle towards him. For their reception, all the guests enjoyed the view from the top of Commerce Club downtown venue in Greenville, SC. Just perfect as the sun was setting! And the bride and groom went up on the rooftop for pictures about this time in the evening. I can’t wait to see those as I know they were perfect. It was such a fun night capped off by sharing in the festivities with some of my favorite people. And then, just that quickly after several dozen dances including, but not limited to, “Celebrate Good Times Come On”, the Wobble, and the ever-classic Cupid Shuffle, they were off, whisked away into the night under the stars. Or sparklers, in our case. Mr & Mrs William David Stanford!!! It was a fantastic weekend full of fantastic people & memories that will stay with me for quite a long while. Much love and happiness to you and your love, sweet Katie. May the Lord always be at the center of your marriage and may you light up the lives of all those around you. I so love the #alwaysroomies hashtag to bookmark a new season for both of you! Katie is blessed indeed by your sweet friendship, Jamie. I can’t wait to see what God has in store for both of you; it will surely be grand for such special girls who are seeking God first. Much love to you dear one! Thank you Mrs. Jean, we are both certainly blessed to have met, lived together, and to have become such close friends and confidantes. It is a new and exciting season for both of us, and I CANNOT wait to see what HE has in store for us both. No doubt we will walk it and encourage one another along the way- celebrating on the mountaintops and praying through the valleys and the unknowns. Your girl is a blessing indeed! Love you too!